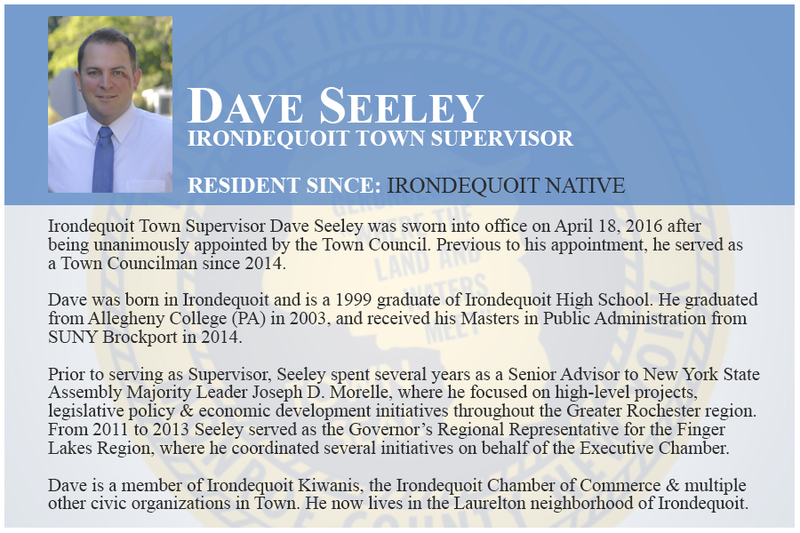 The Town Board consists of the Town Supervisor and four councilpersons, all of whom are elected at-large and represent all residents of the Town. The Board is the legislative body of Town government. Town Board meetings are generally held at 7:00 p.m. on the third Tuesday of the month. 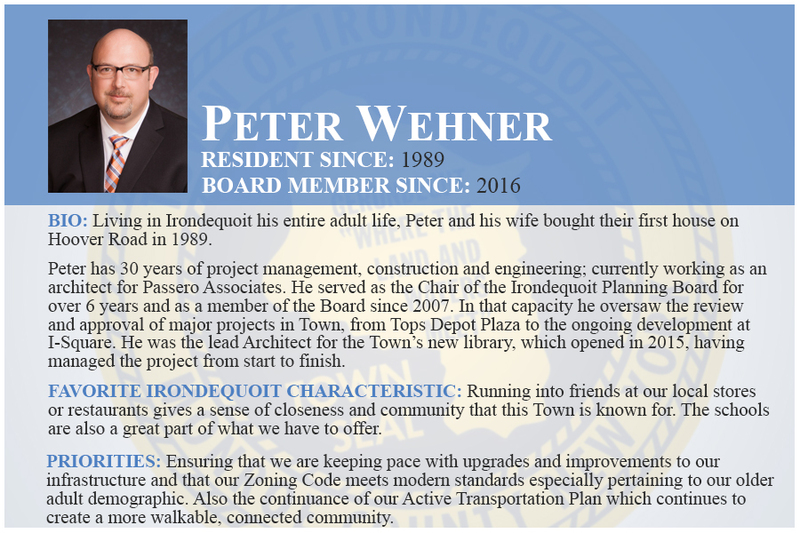 The Irondequoit Town Board 2019 Meeting Schedule is listed below. The regular Town Board meetings are televised live on the meeting night on ICAT-Government Access (Spectrum Cable Channel 1303) and online (www.Facebook.com/Irondequoit). 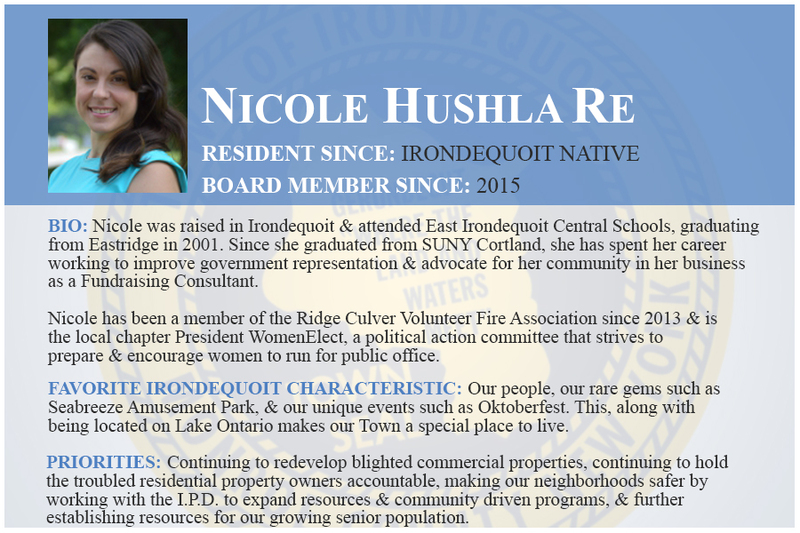 Replays of the regular Town Board Meetings are televised on ICAT-Government Access and can be found online at Vimeo.com/Irondequoit. 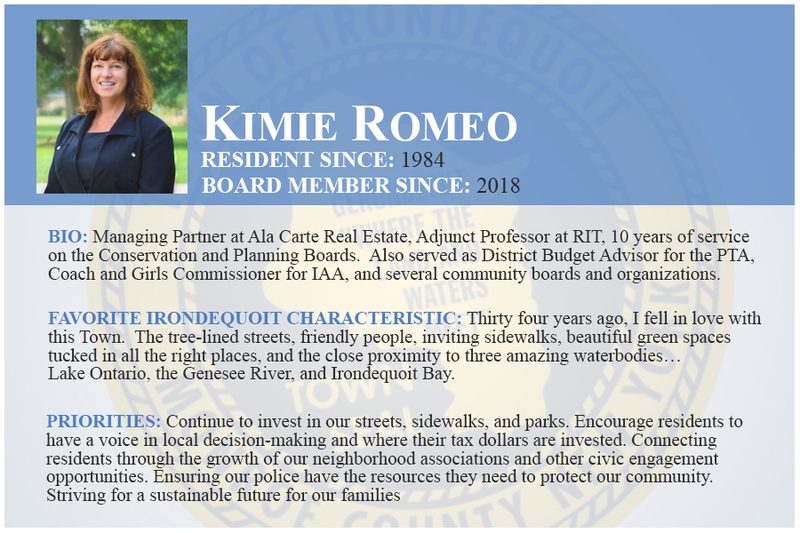 Residents wishing to speak during the Public Input portion of the meeting may sign up ahead of time by visiting the Town Clerk's office at the Irondequoit Town Hall up to 4:30PM on the day of the meeting. Otherwise, residents may sign up to speak when they arrive at the meeting. Speakers will be taken in the order their names appear on the sign-up sheet. Each speaker will have three minutes to address the board. The Town Board also holds workshops to discuss particular topics. Workshops are generally scheduled for 4:00 p.m. on Tuesdays, except for holidays and the week of a regular Town Board meeting. Workshops are open to the public, although there is no public input. Irondequoit retains Harter Secrest and Emery LLC to handle the legal duties of the Town (585-232-6500).